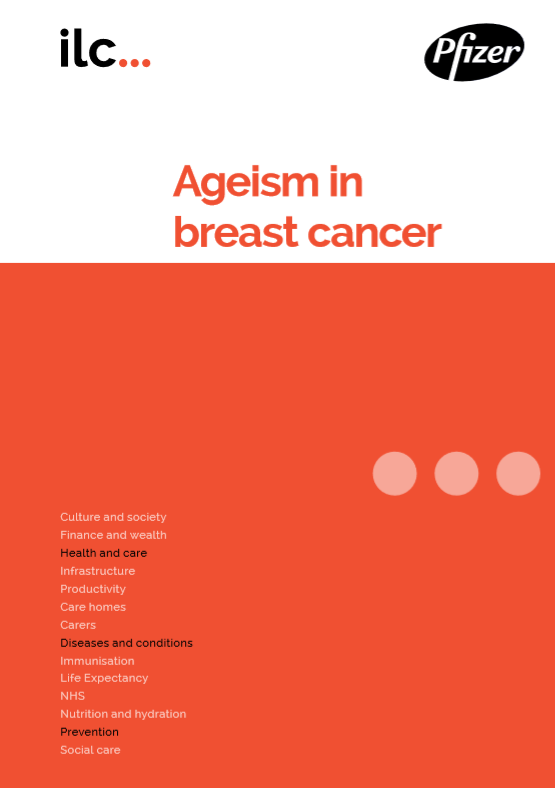 This report examines the extent to which ageism plays a part in the diagnosis, treatment and care of people with breast cancer in England. It also examines some attempts by the Westminster government, and by healthcare systems at a local level in England, to address differences in breast cancer outcomes by age. Age discrimination in the provision of health and care services was banned in the UK in 2012. However there continue to be age-related discrepancies in the prevalence, treatment and outcomes experienced by people with breast cancer. Ageism can manifest in a wide range of ways – ranging from overt discrimination to unconscious bias to internalised ageist stereotypes that can affect individuals’ attitudes and assumptions. While a range of factors underlie the differences in incidence, diagnosis, treatment and outcomes for older people with breast cancer as compared to younger people, the evidence continues to suggest that ageist attitudes, both on the part of older people themselves and on that of clinicians, may impact rates of diagnosis and the treatment that people with breast cancer receive. England has made good progress in improving breast cancer outcomes and in taking steps to address age inequalities, however there can be no room for complacency. Robust data will be critical if we are to be able to continue to monitor, recognise, and combat age discrimination around breast cancer. There is also a need to continue to work to address gaps in older people’s awareness of the signs and symptoms of breast cancer and the risk of developing breast cancer in later life. We also need to take steps to ensure that older people are not prevented from accessing diagnosis or treatment as a result of practical barriers caused by health and care needs or caring responsibilities.